Content and activities for information literacy competencies. The modules in this Toolkit are numbered to help guide you to new understandings; however, you may find that you have to continuously revisit steps in the writing and researching process. Exploring other people's ideas and writings will shape and even change your own, so we encourage you to move backward and forward through these modules in order to allow your ideas to evolve. 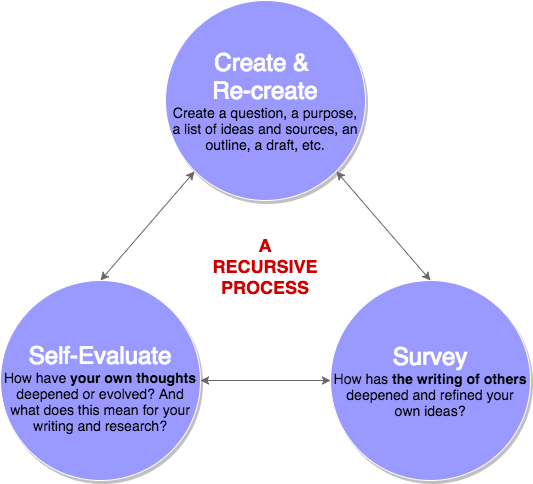 As the diagram below indicates, the process of creation and re-creation is recursive, not linear, and will require flexibility on your part as a reader, writer, and critical thinker. When you're ready to begin, click on module #1 above!